The Kowloon Peninsula is a part of Hong Kong and lies to the southern part of Hong Kong. The Kowloon Peninsula in the foreground. The Kowloon Peninsula makes up part of the Hong Kong Special Administrative District. Also spelled as Kaulun or Kaulung, the Kowloon Peninsula constitutes a portion of the eastern side of the River Delta. Kowloon is the collective term used to refer to the Kowloon Peninsula and the New Kowloon area. Covering five of the eight districts of Hong Kong, the peninsula is closely located near the famous Kowloon Bay. The Kowloon Peninsula consists of two regions. There is more rural activity in the north and west sections of the Peninsula. The region located in the south and east side of the peninsula is largely the residential and industrial area of Kowloon. The southern side of the peninsula directly faces the Hong Kong while it is surrounded by Victoria Harbor. The types of rocks found in the peninsula are monzogranite which is medium grained together with granites from the Kowloon granite. 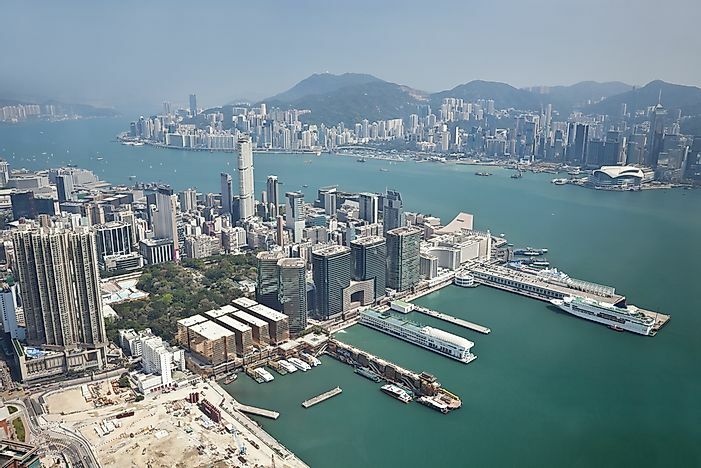 The geographical inclination of the Kowloon peninsula has the areas behind the beach of Tsim Sha Tsui Bay low-lying, as it rises gradually towards the Kowloon Hill located on the western side. Through land reclamation, the peninsula has expanded significantly from the sea. The several phases of the land reclamation that took place before 1904 occurred in the south and west side of the peninsula. The completion of the reclamation in the main areas along Tsim Sha Tsui was completed in 1982. From the early 1950s, Kowloon has been known as a booming industrial center through its textile manufacturing and tourist income-generating ventures. The busy harbors of the Kowloon Peninsula handle incoming and outgoing ocean vessels. The growing population of 2,023,979 in the Kowloon area has led to the diversity in business and social setting that is currently being experienced. Home to the famous Hong Kong’s vibrant markets, the Kowloon Peninsula has two cruise terminals, Ocean Terminal and Kai Tak Cruise Terminal. Located at the tip of this Peninsula, the Tsim Sha Tsui (TST) offers a beautiful view of the world-renowned Hong Kong skyline and Victoria Peak.